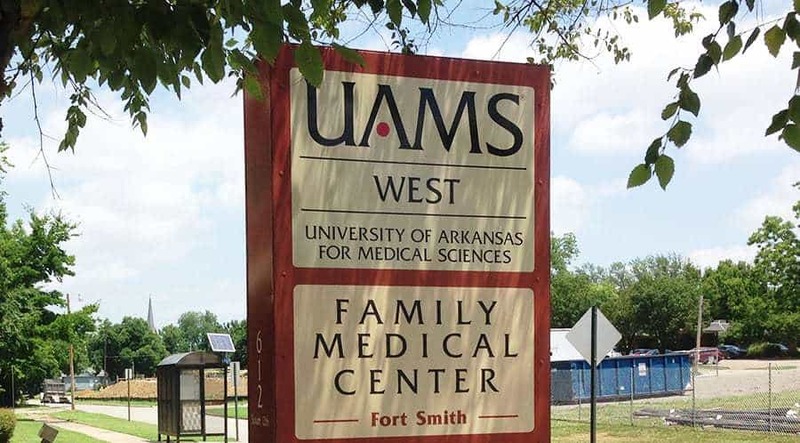 UAMS West is one of eight UAMS Regional Campuses that will receive funding from a recently awarded $4.2 million federal grant. Sept. 28, 2017 | Sept. 28, 2017 | University of Arkansas for Medical Sciences (UAMS) Regional Campuses has been awarded a five-year grant of $4.2 million for professional education, faculty development and recruitment. The federal Health Resources and Services Administration (HRSA), Bureau of Health Workforce, Health Careers Pipeline Branch awarded the grant. The eight Regional Campuses are UAMS Northeast in Jonesboro, UAMS Northwest in Fayetteville/Springdale, UAMS South in Magnolia, UAMS South Central in Pine Bluff, UAMS Southwest in Texarkana, UAMS West in Fort Smith, UAMS East in Helena-West Helena and UAMS North Central in Batesville. Through its Regional Campuses, UAMS trains medical residents in family medicine while providing clinical care and health education services around the state. This funding will support enhanced regional recruitment efforts for high-school and college-level students through a new scholars program; expansion of partnerships with community health centers and other potential clinical training sites; and full integration of behavioral health and interprofessional education into clinical and education processes. Regional Campuses’ new statewide behavioral health director will assess, develop, implement and evaluate these new initiatives that are integrated into treatment plans. A curriculum educator and evaluator will be hired to serve as a central coordinator to work closely with the UAMS Office of Interprofessional Education and the Center for Distance Health. Social determinants of health — addressing a lack of health insurance, education and transportation that may affect a patient’s ability to participate in their own care. Cultural competency — increasing the ability to understand and communicate clearly with patients from other countries or cultures on their own terms. Health literacy — using plain language to educate patients about their care and health. Population health — determining best practices for groups of individuals who share common diagnoses. Practice transformation — educating residents and faculty about quality improvements and payment reforms that are changing compensation and insurer expectations for physicians.